*Borrow a machine. Often a friend or relative will have one they no longer use. If you’re lucky, they might give it to you. If you do buy, try the machine out at the store to be sure you’re getting what you want. *Buy pattern paper for tracing and “share” patterns with friends or relatives. That way, you won’t have to cut the pattern. Just trace off the size you need. *Hobby Lobby has patterns for $1 or $2 pretty often. Check and see. Sometimes it’s an unadvertised sale. *Use remnants when you can. Our local Wal-Mart still carries fabric, so I go through the remnant bins every time I’m there. For small projects, it’s great. Often there will be up to a yard of fabric in each remnant. *Some community or extension centers offer free or low-cost classes. Sometimes a tech school will do the same. Or if you have a friend who sews, trade off and teach her a skill in exchange for sewing lessons. *Check out the library for books before you buy. 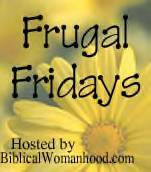 Frugal Fridays are sponsored by Crystal at Biblicalwomanhood. Thanks for the tips. I’ve yet to see an uncut pattern cause so far all mine have been used. My mouth drops when I think about spending $7+ dollars for one pattern. I have never checked at Hobby Lobby – so I will definitely look into that – Thanks. I’ve had great luck finding patterns on Ebay and last summer I had a blast finding some great sewing accessories and fabrics at yard sales for very cheap.